Henshaw, Archie, head-of-household, age 38, born in Canada; father born in Canada; mother born in Scotland; immigrated 1885; single; occupation: farmer, general farm; owned farm (free). Henshaw, Nancy, sister, age 45, born in Canada; father born in Canada; mother born in Scotland; immigrated 1885; single; occupation: none. 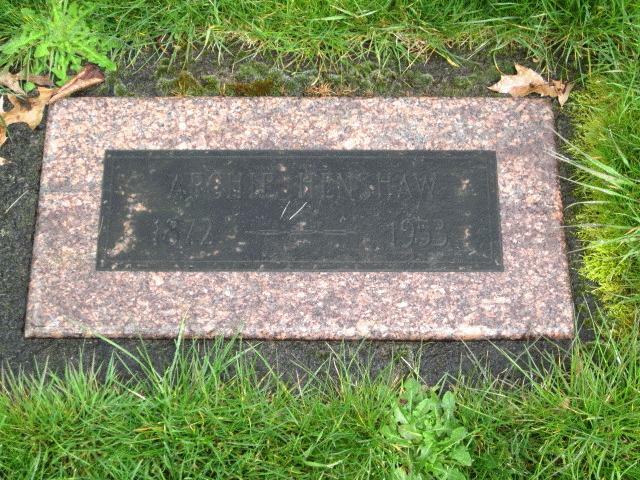 Henshaw, Archie, head-of-household, age 48, born in Canada; father born in Canada; mother born in Scotland; immigrated 1886 [or 1888 - unclear]; single; owned home; occupation: none. Henshaw, Janet, mother, age 81, born in Scotland; parents born in Scotland; widow; occupation: none. Henshaw, Archie, head-of-household, age 59, born in Canada; father born in Canada; mother born in Scotland; immigrated 1885; single; owned home; no radio in home; occupation: farmer, general farm; not a veteran. Henshaw, Dougald, brother, age 65, born in Canada; father born in Canada; mother born in Scotland; immigrated 1885; single; occupation: laborer, farm. Henshaw, Archie, head-of-household, age 68, born in Canada (English), naturalized; completed 8th grade; on Apr 1 1935 was living in the same house; single; owned farm ($300 value); occupation: farmer, farm. Henshaw, Dugald, brother, age 74, born in Canada (English), alien; completed 8th grade; on Apr 1 1935 was living in the same house; widower. posted Jan 24 2005 by Jacie () to CAN-ONT-WELLINGTON-L.
1881 LDS census index, Erin Township, Wellington South, Ontario; NA film C-13258, District 151, Sub-district E, Division 3, page 17, household #77. 1910 census, Fairmount Precinct, Benton County, Oregon; roll T624-1278, ED 5, page 81B, line #82, dwelling #107, family #107. 1920 census, Tangent Precinct, Linn County, Oregon; roll T625-1496, ED 291, page 2A, line #25, dwelling #30, family #31. 1930 census, Santiam Precinct, Linn County, Oregon; roll T626-1947, ED 42, page 4A, line #30, dwelling #83, family #83. 1940 census, Santiam Precinct, Linn County, Oregon; roll T627-3371, ED 22-45, page 5B, line #49, household #113. Contribution from Sheri Henshaw Neuschwander (). 1920 census, Tangent Precinct, Linn County, Oregon; roll T625-1496, ED 291, page 2A, line #21, dwelling #28-29, family #29-30. 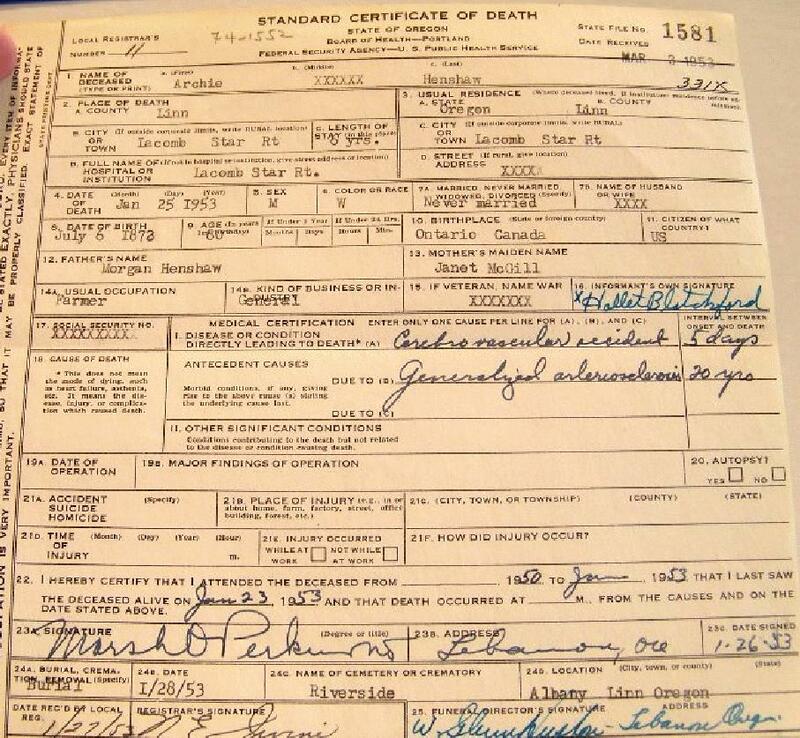 Oregon Death Index, 1903-98; Ancestry.com.